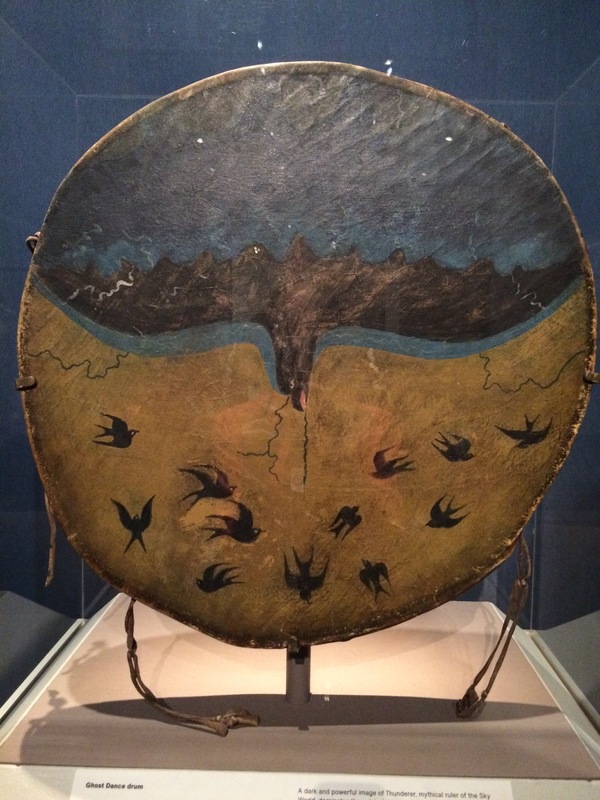 The pic is from the recent Plains Indians exhibit at the Metropolitan Museum of Art in NYC ==a ghost dance drum. This entry was posted on July 4, 2015 at 5:50 pm and is filed under 55, poetry. You can subscribe via RSS 2.0 feed to this post's comments. That drum painting is wonderful! And your poem both arresting and haunting. Such a tender, poignant piece! I once married young. Everyone should try that. Just stay out of jail (prison). We did, tnx to ____? I love the artefact you have shared with us – it is beautiful. Your poem is wrought so well, I would not have thought it was constrained by a particular word count. Each stanza offers a whole thought, and the entire piece delves deeply into the human condition under which we all labour. You soar and make us swallow, both, in this, k. As Kerry says, each stanza closes a compelling thought, but the last seems to unite them in a way that has the ghostlike spirit of that very evocative artifact within–the ghost dance of a time and a character escaped and only able to be evoked in a ritual of memory and want. Or so I read. Really so much here in so few words. This is a truth, at least for me. Wonderful work. Ok, this is now my favorite. Love the word-play, the images and each stanza is better than the one before it. How I love that ghost dance drum. Wow! I need a drum! Loved the poem….especially the swooping swallow stanza. Too much of my flight a fleeing. Oh I can feel some ache in this lovely little piece. I just love this! That second stanza is so cool. Wonderfully true and I am quite charmed by the drum. A lovely post, k. Hope all is well in your world today. Thanks, Jamie. I am okay. A little tired as we have had a couple of big events in our family lately. k.
I hope they were all happy events, k.
Yes! My daughter’s wedding, which was at our house upstate! That was really the main event, but it corresponded with more extended visits from family members that have also been events in a way. Thanks. k.
Love the photo. We begin life thinking nothing will pluck our wings, but life proves us wrong. I hope the events were happy ones.